As much as we would all like to stay digital and avoid paper, there is no way around it. Email deliverability and open rates keep dropping. As hard as we try, the spam folder still manages to catch some of our emails. Being one hundred percent dependent on email as our sole marketing vehicle amounts to suicide. At least once a month you must use snail mail to reach out to your database of catering prospects and customers. Being that the average catering order starts in the hundreds of dollars and can run into the thousands, you don’t want to leave your future catering business in the hands of just email. With that being said, don’t abandon email. Considering it is basically free to use and quick to set up, this extra touch point is a must on your monthly marketing list. You never know when that perfect catering prospect is ready to give you a shot, so make sure your name is always at the top of their mind. If you can’t be number one, then make sure you’re their number two. For years I have been teaching and preaching the virtues of a monthly email touch points. Whether you are promoting a seasonal menu or a monthly special, take a few minutes to create and send that email. Up until now, Restaurant Catering Systems required you to create your own email promotion from scratch and copy and paste it into our email editor. We do have marketing templates you can use for inspiration on our members only website; www.RestaurantProfitPoint.com. One thing I have learned over the years; make things as easy as possible for our clients. 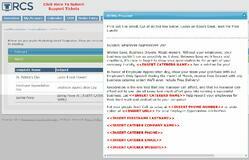 Restaurant Catering Systems has just built an email template system. These email templates are preloaded into our catering software. Just click on the month you want to promote to see all of the email templates. Once opened, just click on the Preview link to see the email. When you’ve decided on your email template for the month, just hit the “Create Campaign” button and follow the steps. You can create the emails in advance and pick the date and time for it to go out. On a side note, I would only send out text based, not html based, emails. Though the pictures can look very attractive, they shout out “I’m an ad”! Text based emails are how we communicate with our friends and business associates. The open and read rate is much higher. Whether you choose to use one of our email templates or create your own, please don’t let a month go by without sending at least one out. I can tell you from personal experience; the months I fail to send out my blog article, sales suffer. One attendee, Vince with Trinacria credits us with his best catering Christmas season. He did over a hundred thousand dollars in catering for December 2014 versus $12,000 in 2013.